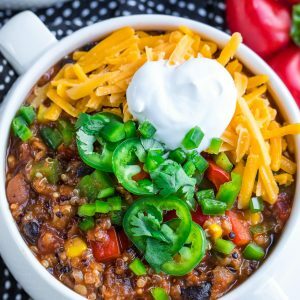 This Instant Pot Vegetarian Quinoa Chili is a comfort food classic with a healthy plant-based twist! To make things uber-easy I’ve even included slow cooker instructions too. Game on! Lately I’ve been trading my nightly Netflix sesh in favor of curling up with a book and it’s a freaking nightmare. When zoning out to my my new favorite show of the week, I am SUPER capable of turing it off at a somewhat reasonable hour and passing out. It doesn’t keep me up at night whatsoever and I’m pretty sure it helps me clear my mind of the day and PTFO. When I grab a book, I’m basically screwed. I am 110% incapable about putting down a good book. There is literally no resisting it. Each page turn becomes more essential than the last and there’s NEVER a good part to pause for another day. Never ever. I’d just as soon watch the sun rise, book in hand, than attempt to put that bad boy down. In the event that I do manage to plop the book down (or finish reading early) I’m left with another problem: my mind won’t shut off. I’ll find myself contemplating the next curveball to thrown into the plot or obsessing over how the book ended and just how terrible this book hangover is going to be until I can find a replacement book. When a particularly epic book hangover hits, there’s no comfort to be had until I find a worthy replacement. A replacement I, in turn, read as fast as humanly possible only to leave myself feeling empty and tragic and desperate for another rush… thus restarting the vicious cycle. Thankfully I can find comfort in a nice piping hot bowl of chili. I’m not too proud to eat my feelings and this heathy chili is JUST what the book doctor ordered. I promise I’m not usually this weird! Each tasty bowl is plant-based + gluten-free and can easily be made dairy-free + vegan since you choose the toppings! 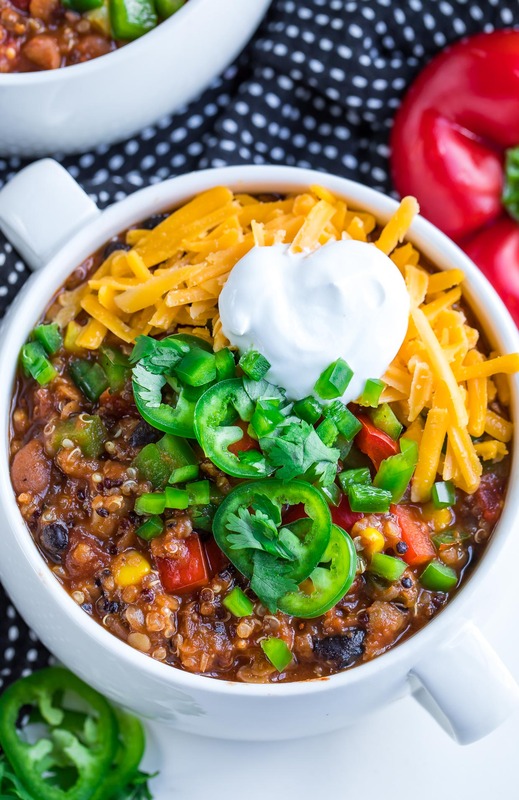 This Instant Pot Vegetarian Quinoa Chili is a comfort food classic with a healthy plant-based twist! Recipe yields 12 cups of chili. * This recipe works best with red lentils as they cook fastest and require less liquid than brown/green. If cooking in the pressure cooker - use red. To ensure all the goodness in this pot has enough liquid to cook, I've adjusted the broth to 1 quart (4 cups) at the suggestion of a few kind readers! The chili will thicken more as it cools. Love beans? For an extra chunky chili, additional black beans or pinto beans can be added after the chili is done cooking! (Just not in the beginning because the pot is sensitive to being too full) Simply add in your favorites and then sprinkle in a bit more of the spices, to taste, to even things out. Easy peasy! Nutrition Facts below estimated before toppings using an online recipe nutrition calculator. Adjust as needed and enjoy! 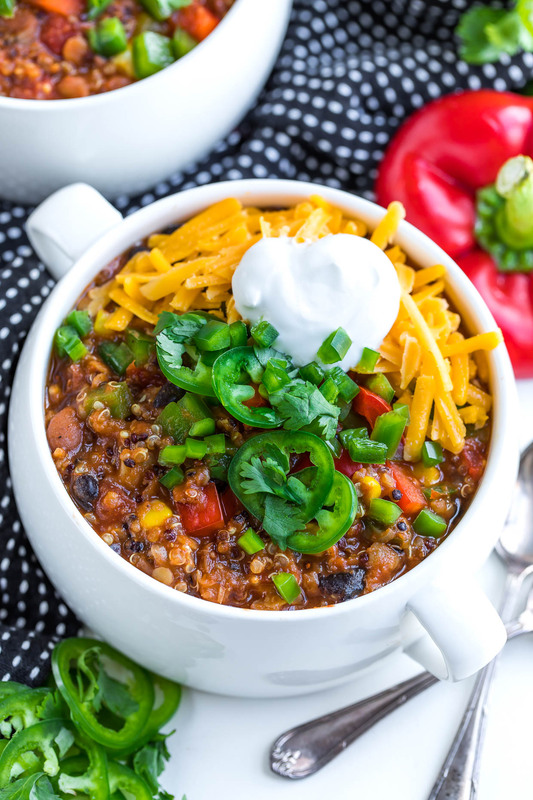 This delicious chili can absolutely be made stove-top or in your handy dandy slow cooker. Simply print the above recipe and use these handy dandy instructions below. To use a slow cooker, you’ll want to decrease the broth in this recipe from 4 cups to 2 cups. AKA just use 2 cups of broth here and you’re good to go! Add all ingredients to your slow cooker (minus your toppings) and walk away. It’s that easy! This recipe takes about 5-6 hours on high. You’ll basically want to let this one simmer away until the lentils, quinoa, and veggies are super tender. The chili will thicken as it cools. For extra flavor you can even sauté the aromatic veggies before adding it to the slow cooker, but it’s not at all essential. As I mentioned above, adjust the thickness to your liking with extra crushed tomato or broth and season to taste based on any changes/additions. Pile on the toppings and get ready to faceplant into this ultra-comforting bowl-o-veggies! 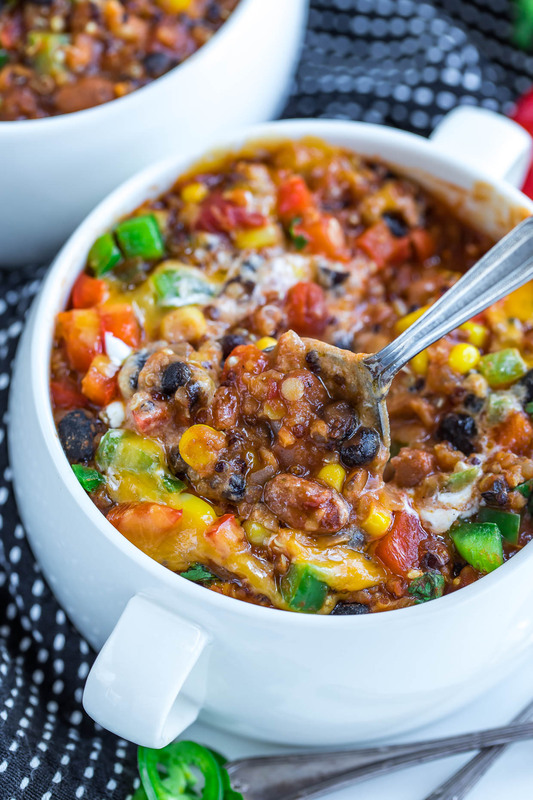 No matter which method you choose, I can’t wait for you to try this Instant Pot Vegetarian Quinoa Chili! Chili does NOT look this pretty when you dive in spoon first, amirite? It’s a hot mess of veggies, quinoa, beans, and cheesy goodness and I’d be kidding myself if I didn’t admit I love the look of it! So pile on the toppings, grab a spoon, and swirl that chili into the beautiful mess it was meant to be. I’m certain it tastes better this way too. The WOOL Silo Series – I tried to read these extra slow to make them last longer and failed miserably. I tore through them and LOVED it! The Disappearances – Still completely hungover from this amazing story. Gray Wolf Island – My friend Tracey wrote this book! Whoo! I made this on April 8 2019. I followed the recipe exactly and it turned out great. There were 2 small areas on the bottom of the instant pot that stuck but no problems with the program. I added another cup of beans after it was done. It thickened quick a bit for the second day. It makes a large amount so I froze some. Will definitely make this again. I threw this recipe together willy-nilly and it turned out great! I was a little hesitant to try it due to some of the comments below about the burn notice. However, I had no issues despite not following the directions to a t. I stirred the ingredients before pressure cooking even though the directions say not to stir. I used more quinoa because I was short on lentils. Used different types of beans and eye-balled the chopped veggies. Making it again tonight! Instant Pots are fiesty little things, haha – I’m so stoked it’s making repeat status and that it worked great with the swaps! Thanks Aurora! Where is the nutrition stats on this recipe? I followed your recipe as written, but used chicken stock instead of vegetable. I got the BURN message no less than six times. I didn’t do anything in response, just let it play out. Final product was so delicious. A small amount had stuck to the bottom of the pot, but did not negatively affect the taste of the chili. YAY! LOVE the added chickpeas!!! Thanks Ally! this recipe has different ingredient amounts if i view it on my phone…..like really different. can u please confirm if i should use the one on your website on my laptop, or how it appears on my phone? Can this recipe be doubled? Also I have made this a dozen times and it is always amazing!!! So glad you’re loving the recipe Ashley, thank you!! If you’re using the stove top or slow cooker instructions it can totally be doubled! The instant pot would be over max capacity so I don’t think even an 8 QT Instant Pot could handle doubling. Thanks for the recipe! Are the black beans to be used dried not canned? Thank you! Hey Kristine! You want to use canned/pre-cooked black beans here since dried black beans take so much longer than the rest of the ingredients to cook. I also love cooking up a large batch of IP black beans (from dried) on their own and then freezing them in little 1 cup portions so I can add them to soup and chili recipes! We are currently trying this recipe but are repeatedly getting the burn notification on the instapot. After perusing the comments, I’m checking each and every ingredient and I used a different quinoa. I don’t know if that’s why, but The quinoa is sticking to the bottom of the pot. Also, I am an instapot noob and I didn’t realize I should probably put it on the pressure cook setting and not the bean/chili setting (hopefully this works). I LOVED this recipe!! This is probably the best recipe I have come across and it’s so easy to make. I would add more Beans to it though, but other than that it was perfect. The corn is a really good addition to it. The flavor is incredible!! Day = Made! So glad you’re loving it Jennifer! You can 100% add more beans after the fact for the bowls you plan on reheating (the leftovers rock my world!) – I like my chili extra chunky too! Hi! I noticed it had oil in the ingredients but I think you missed putting it in the directions. I couldn’t get the recipe to cook. Kept getting the “burn” notification. Ended up transferring the ingredients to my crock pot and hoping for the best. Hey Ellen! This is one of those recipes that I’ve made half a dozen times now and can’t seem to replicate a burn to save my life *but* I know even the tiniest ingredient swap can trigger a burn notice in the pot b/c the chili is crazy thick. I’ve contemplated adding more broth to the recipe (I’ve already upped the amount quite a bit) but any more and it might end up soup vs. chili. It should work marvelously in the crock-pot. Did you use red lentils (vs green or brown standard lentils) or change anything up (ingredient choices or measurements)? Thanks for helping me troubleshoot! Hi Jenn. I also got the burn notice (3 times) in my 6qt. I followed the directions to the letter with no substitutions. I persisted in scrapingeach time and eventually got it to pressure. It was a HUGE hit! I’m thinking of moving the quinoa and red lentils closer to the top. This recipe is on constant repeat at our house. It’s that good. That easy. I have a 6 qt pot and add the can of tomatoes in the very beginning. My daughter is vegan and loves it. My husband is all carnivore and the quinoa looks like hamburger so we just don’t tell him ? Thank you for your reply but I just reread the recipe and I originally read 2 CANS of crushed tomatoes not 2 cups! Btw this was delicious for a Lenten Friday dinner! Recipe worked well for me although I would recommend cooking for 8+ minutes instead of 5, I did the 5, waited 10 min to release, and added an extra 2 min because it was not done enough for my preference. Tastes very good ! If I don’t have red lentils and only have the brown ones would I change the cooking time? Hey Tami! Everyone that has used brown lentils seems to have burn issues in the IP and I’m thinking it’s because they need way more liquid to cook but then it needs so much liquid that you either end up with and overfilled pot or chili-like soup. I’m going to run a test batch soon with brown lentils using a halved version of the recipe and a bit more liquid to see if I can find a happy medium so that I have a brown lentil and red lentil version to share. Even after adding 4 cups of vegetable broth I got the burn indicator 🙁 I added 2 more cups of water and it happened again. I wouldn’t suggest this recipe. So sorry to hear it Lucy! Do you mind letting me know if you made any swaps to the other ingredients in the recipe? (extra of anything or something different in place of an ingredient?) As written, I’ve tested it several times myself and had a dear friend test it as well with success so I’m wondering if it’s just super sensitive to any changes? 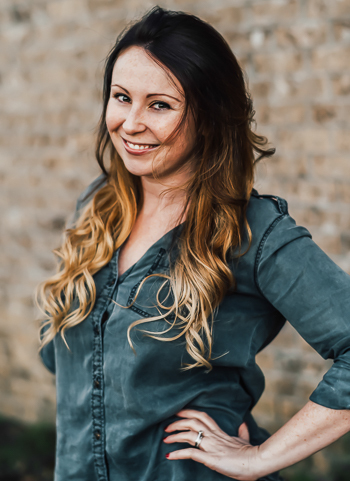 I appreciate the assistance and feedback! Guilt-free indulgence. This chili was packed with flavor and textures. The quinoa made it hearty and filling. Another recipe in the books that is to die for. Perfection! My husband and I ate this for dinner tonight and it was amazing! It was actually quite hearty for vegetarian meal. The recipe is very easy to follow. This will make a great freezer meal! My Instant Pot showed me the “burn” indicator even after I’d emptied the pot and cleaned it. I added more than double the amount of vegetable broth and still it burned. So frustrating. There isn’t enough liquid in this recipe. Edited to add: Personally I think I needed more liquid, it was really thick. Maybe not a lot but at least another cup. I’ll make it again since it was so good, even as a soup! Karen was sweet enough to troubleshoot with me via email (thanks again love – much appreciated) and though I can’t seem to replicate the burn notice on my Instant Pot I have adjusted the recipe to contain a full quart of vegetable broth (4 cups) and I also took out the onion sautéing step and instead just popped the onion and garlic in the pot with the rest of the veggies. It takes a little longer to come to pressure so I reduced the cook time to high pressure for 5 minutes. Just opened a fresh IP of quinoa veggie chili (helloooo lunch!) and though it does seem to be less thick than the original recipe, it does thicken quite a bit once it cools – yum! Diving in right now! I also had the BURN issue. I added one cup of extra stock, and then a can of diced tomatoes on the second round, and every time it continue to burn to the bottom. Even on the lowest temperature setting. I suspect this was due to two errors I made: first, I decided to use the new Christmas hand blender to do the onions, which reduce them essentially to mush. Also, I added the spices at the wrong point, causing them to join with the onions and create a sticky paste. Despite everything that followed, I suspect that was probably what caused the problems for me from the beginning. This is happening in our kitchen soon! Love it! How would I make this with dry kidney beans and dry black beans? Hi Rachel!I make a black bean dip with dried black beans and peppers/onion mixed in and what basically happens is that the delicate vegetables go beyond the point of tender and turn to complete mush (which is great since I’m blending the dip with a blender and all I need them for is flavor) but with this recipe, you don’t want the rest of the ingredients to be total mush. 30-40 minutes of high pressure (plus pressure build and release time) are usually needed to cook dried beans (and a little longer for kidney beans from what I’ve read) and that is a lot of pressure for the veggies to endure, so they would lose their shape/texture/etc. My favorite time saving hack for skipping cans entirely is to make my beans in the IP meal-prep style and then freeze them all measured out in 1 cup or 2 cup servings after cooking/cooling. This way when I need beans for a recipe I can use my cooked-from-dried beans that I’ve cooked up in my IP and bypass the need for cans entirely! I try to do this whenever possible bc it’s such a time + money saver in the long run! ? This is an awesome idea. Thanks for sharing. I’ll be making this in my pot tonight. I can’t wait. Thank you Satu! Hope you love it as much as we do! Hi. Love all your recipes and got an instant pot for Christmas. Usually you state which lentils to use or color rather but I don’t see it for this recipe. Please advise. Awesome! Those are what I always have on hand from your vegetarian lentil tortilla soup. Which is my absolute favorite btw. Happy New Year and thank you!! Hi. I made this recipe as written and my Instant Pot kept displaying the Burn error and would not get up to pressure. I had to open the lid and add three cups of water, stir, and re-start. Dinner was late but it was really delicious. This made a huge amount—fed four people and still had half left over. If that was “weird”, please continue to keep it weird 🙂 I too could join Readers’ Anonymous. We could totally run the RA book club together C.J. 🙂 Mwah! Anyway, this chili looks great; I’ll definitely try it. So glad I’m not alone there! I have a few books en route in the mall right now and I know at least one of them is going to leave me sleepless and hungover til I read the next one 😉 lol!